It really wasn't a promising start and heavy snow had been falling through a sombre grey sky for the first hour or so around sunrise. 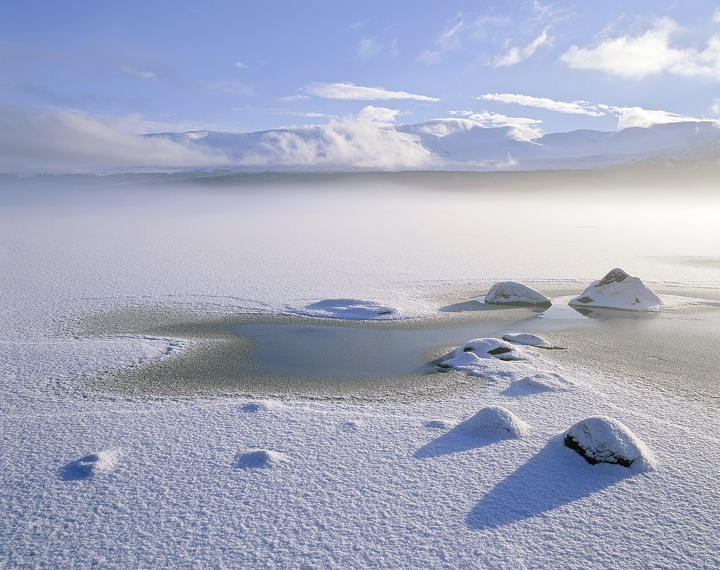 However it showed signs of breaking up and within twenty minutes the sun burst through illuminating the great ice shelf of frozen Loch Morlich. The scene was already transformed but the ice shelf began to release condensation forming a bank of mist that floated lazily a couple of metres thick above the ice sheet and then a delicate breeze wafted it towards us creating this ethereal beauty that held all there captivated.